The Ray D'Arcy Show airs on RTÉ One this Saturday 3 November at 9.35pm. Football legend Jason McAteer and actor Brian Gleeson are among the guests on this week's Ray D'Arcy Show. Gleeson and his Taken Down co-stars Lynn Rafferty and Aïssa Maïga will be in studio to talk about RTÉ One's new Irish crime drama, which comes from the makers of Love/Hate. Former Republic of Ireland winger Jason McAteer is set to talk about his career to date and being a mental health ambassador. To celebrate 10 years of collaborations, D'arcy will be joined by Brendan Courtney and Sonya Lennon, as they look back on their time on Off The Rails and how this led to the launch of the hugely popular Lennon Courtney clothing range. Courtney's mother Nuala will also join Ray to chat about their upcoming RTÉ One documentary, We Need to Talk about Mam. Also, Mary Coughlan will talk about her most ambitious project yet which sees her team up with Bjork's producer in a theatre production about her own life story. 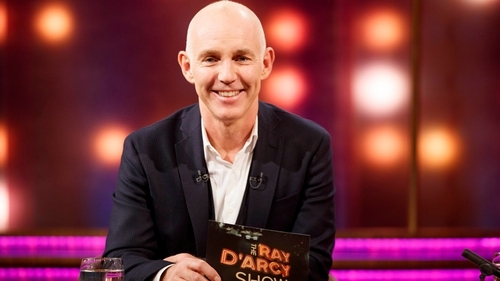 The Ray D'Arcy Show airs on RTÉ One on November 3 at 9.35pm.